Pop-country singer Shania Twain enlisted the help of 12 YEA! drummers for a concert at the Continental Arena in New Jersey last week. 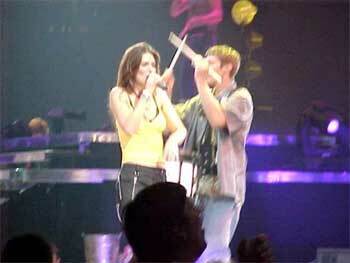 Shania Twain tangoes with a snare drummer. YEA! 's Christine Higgins documented the evening: "21 drummers came together on very short notice (less than 12 hours) to take part in the Shania Twain concert that was taking place later that evening. We all gathered in lot #21 with great anticipation as to what was to happen next. We were lead into the depths of the Continental Arena into a "Green Room" and a member of Shania's troop met us there. "A few minutes later two members of her band came into the room and were introduced to us (her drummer and a fiddle player) and explained what would be happening next. The two performers told us that they were going to audition the drummers and take 12 to be in the concert for that evening. This was news to all of us and quite the surprise to the drummers that arrived since a lot of them came some distance and had to get out of school early to be apart of the big event. "They continued to show the drummers the lick that they would be playing that evening and picked their 12 drummers. After they picked their 12 drummers, tickets were handed out to all who auditioned, plus one guest each. The 12 drummers then had to stick around for a soundcheck with Shania's band. Unfortunately for the drummers, Shania never made an appearance. After the sound check we were all lead out into the parking lot where we had to wait for the concert to begin before we could take our seats. "We did have some fabulous tickets for the concert -- all floor seats, and most of them about five or six rows from the front of the stage. Shania put on a spectacular show, and then the USSBA drummers took the stage for their long-awaited appearance for her last tune before her encore! You could see the excitement in the drummers' eyes as they took the stage with Shania and her band in front of thousands of people. All in all I believe that everyone had a great time even if some didn't get a chance to take the stage." Participating drummers were Derek Townsend, Alex Padron, Mike Terer, Mike Barich, AJ MacDonald, Dodger Eaton, Kevin Kern, Matt Meakes, Matt Tanzos, Phil Rusher, Doug Ferraro, Shaun McGarrigle, Brandon Creel, Willie Robinson, Keith Leshoshy, Dan Jones, Michael Zacharkow, Chris Garnecki, Steve Milone, Jessica Fake, Zach Appleton.